I'm not going to lie. I have a really fun life. I have fun friends and together we do really fun things. Who gets to spend a day in LA at an American Idol taping? Every single minute, even the ones where we were totally MELTING, or had to use the port-a-potties, or when I broke down and bought a diet coke from the vending machine, was crazy, silly, giddy, fun. But in actuality, the fun hadn't even really started yet. After the crowd warmer up guy did his thing (we won a free McFlurry for being the rowdiest section) the show started. Ex to the cit to the ing. Seriosuly. How HAWT is J. Lo? She has a full time hair petter. Didn't know that was a job did you? During every single commercial break, (which are four minutes long by the way, I had no idea how much time our DVR save us. Crazy!) this guy would come out and smooth and pet her hair. Not kidding. For four minutes. Can you imagine his resume? How can I get him to come work for me? Because I have some major FRIZZ to deal with up in this place. If by chance you were looking for us or our signs in the audience, no such luck. We were above and behind the stage. Perfect for a 360º view. Not so perfect for this shorty girl to get any airtime. 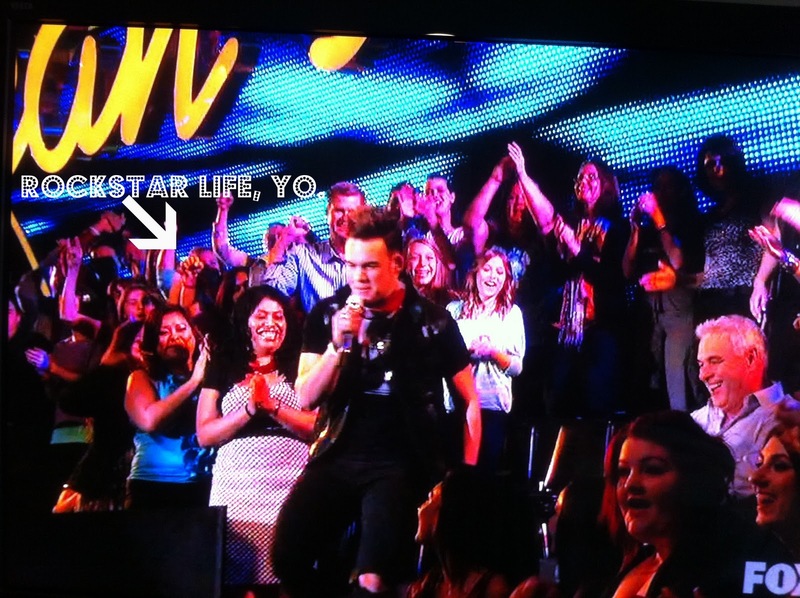 But my arm, one eyeball and forehead had their primetime debut during James Durban's song. The song where they made us rock out with our fists in the air. Not kidding. The stage manager gave us lessons during a commercial. J Lo got her hair petted and we were taught how to be rockers. But the best, best, best part of all was the most unexpected. After leaving the studio, walking all the way to The Grove, looking for someplace to eat, bummed that the Nordstrom's didn't have a cafe (rich people problems), we decided instead to grab something on the way home. As we exited the Grove I spotted Casey's parent's. "There's Casey's parents." as I stealthily pointed them out. She answered, "lets give them our signs!" To which I retorted "NO!!!!!" To which cooler-than-me Julie said "YES!!!!!" As they walked over and started talking to them. Cooler Julie asked if we could get a picture with them. They were so sweet and excited about the signs. I offered to take the picture. Obviously. Because I was DYING!!!! But Cooler Julie gave her camera to a random dude and forced me to be in the pic. Dying that Mr. Abrams is holding a sign that says YUMMY! Dying that this is really happening. Dying that I stammered out to his mom "thanks for raising him on Jazz." But that is why I like them. Because they are quirky and silly and different. Because they raised a musician with a passion for MUSIC, not just singing. Because they raised him on Jazz. 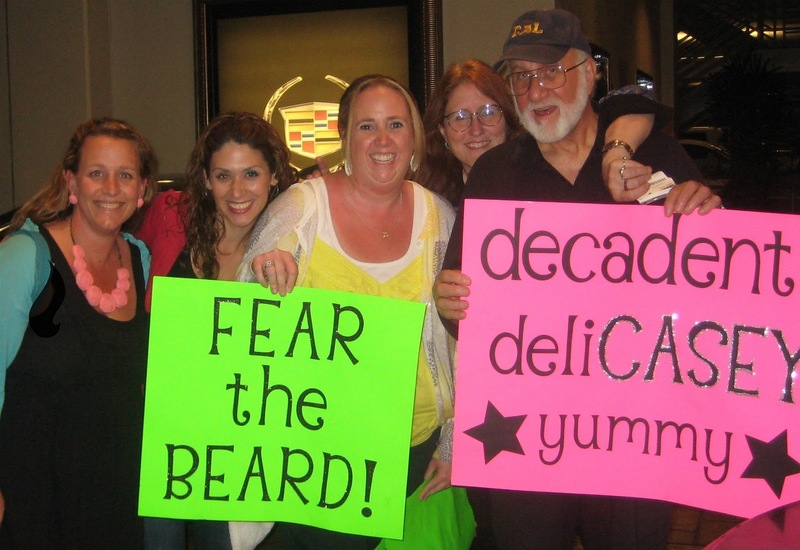 Because they were excited about our silly signs. My coolest celebrity encounter to date. such a cute story. hahaha. and girllll as for all of the awkward things to say to famous people - TOTALLY NOT AWKWARD. You were smooth like butta. :) At least in my book. This has nothing to do w AI, but just wanted to let you know I adore you and your uplifting, funny and helpful blog. I made cheater baked ziti last night, so yesterday you helped me put a great meal on the table and today you made me laugh. Thanks dude. So freakin awesome. All of it. I love that Jlo has a hair petter. I mean seriously. I spotted Brooke White after she performed at the state fair in dallas, and I had a super dorky reaction wanted to get a picture, but just froze and acted like a silly person. ugh. They are just people... I don't know why I have those reactions. And dorky me was SO scanning the audience for you. I was even scanning up there in the top when James came down, but didn't manage to spot you :(. Loved hearing about all the happenings. Oh my gosh how fun was your time!! A hair petter eh. Wow, that is pretty crazy;0 and your friend was smart to get a pic with the parents;0. You will be really happy that you have that forever!! awesome! I totally think he does. What a super fun night! This was the best post! Rock on!! Sounds like you had a blast! I would love to do somethign like that someday. You are awesome! "thanks for raising him on Jazz." claaaaaasic Peg is, from now on, claaaaaasic Jules. thank you for this rad recap. PS sorry to spill the deets tonight. Claaaaasic Marta! Love it! your so cute! Ive soo been waiting for this post to hear all about it! so exciting!!! sounds like yall had a blast, love that you got to top it off with pics with caseys parents. and i love your comment to them, classic. :) glad you had fun! I love it, I love it! How fun - I have never been to any sort of tv taping (and hello - super dork party of one over here too) that's kind of one of my dreams to be in a tv audience. dying dying DYINGGGGG. you could not have planned that more perfectly. speaking of, j lo IS perfect. but it's surely because of all the hair petting. and beardy's dad was a total sport. a yummy sport. LOL! my fave line by far. that story is AWESOME!!! so funny. 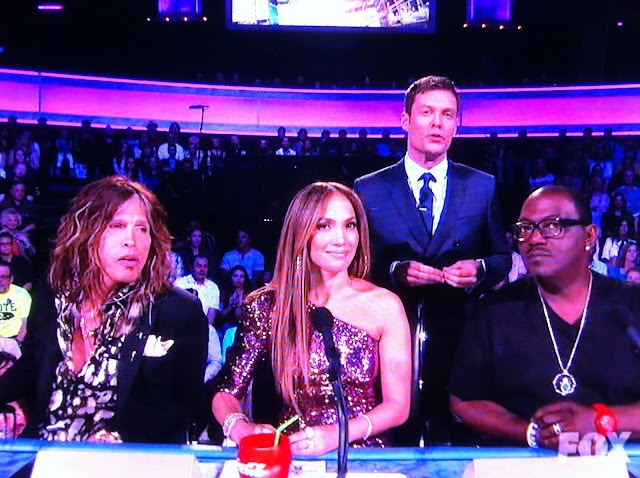 in addition to the hair petter, does J.Lo also have small puppies jump through those earrings during commercials? Great recap! I was watching for you all last night - and I thought for sure I saw you too, guess not! You guys made awesome signs. Laughing at your introvertedness being outed by friends! Love it! That was the FUNNEST! I love that you guys ran into his parents afterward - what a terrific way to wrap up your adventure! We DVRed it and didn't watch until last night. I did see a bright pink sign behind the stage at one point, but it was too far off to read. I wondered if it was yours? My favorite post of yours ever. I love Casey too, and that he was raised on jazz. And that you acted like a dork to his parents. I'm a first class dork myself and I like other dorks a lot. What a great time! you are the coolest person i know...today anyway. hair petter?! i need a hair petter!!!! i could be a hair petter. if you want i will intern as your hair petter (i would be so good. too good, your hair would look awesom all the time). i have references, just as my kids, i pet their hair all. the. time. Ok, since my hub took a job at our local church and we have less income- we DO NOT have TV or Cable!!! Thank you for making me feel somewhat current on the whole Idol deal- you are hilarious and I'm so glad you went and had a BLAST!!!! This is too cool, Julie -- from your arm being broadcast, to your chance meeting w/ the Abrams. Awesome. The whole shabang. 1. Did JLo's hair-petter always dream of being a hair-petter. I forgot the question marks in the above comment. fail. My husband loves S. Tyler. Has had a thing for Aerosmith forever. He also read your post and loved it. Question: Does S. Tyler look as gaunt in person as he does on tv? Just curious. No wonder J-Lo looks great all the time, with her own personal petter, who knew!? Ummm - did you tell them your hubby was the drummer for The Supertones. They probably recognized you from the video and were dying. Just dying.